Our industries have expanded to such a point that they will burst their jackets if they cannot find a free outlet to the markets of the world. Our domestic markets no longer suffice. We need foreign markets. Cherish your visions and your dreams as they are the children of your soul; the blue prints of your ultimate achievements. Never murder a man who is committing suicide. The history of liberty is a history of limitation of government power, not the increase of it. Some Americans need hyphens in their names, because only part of them has come over; but when the whole man has come over, heart and thought and all, the hyphen drops of its own weight out of his name. No nation is fit to sit in judgement upon any other nation. Once lead this people into war and they will forget there ever was such a thing as tolerance. Just what is it that America stands for? If she stands for one thing more than another it is for the sovereignty of self-governing people. Golf is a game in which one endeavors to control a ball with implements ill adapted for the purpose. There is such a thing as a man being too proud to fight; there is such a thing as a nation being so right that it does not need to convince others by force that it is right. No man can sit down and withhold his hands from the warfare against wrong and get peace from his acquiescence. 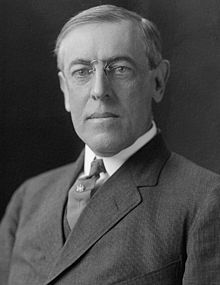 23 quotes by Woodrow Wilson.